Synopsis: At the snobby Crawford Academy, popular high school senior Virginia Wainwright survives a freak accident, but suffers from memory loss and traumatic blackouts. As she attempts to resume a normal life, something terrible is happening – her friends are ruthlessly murdered one-by-one. 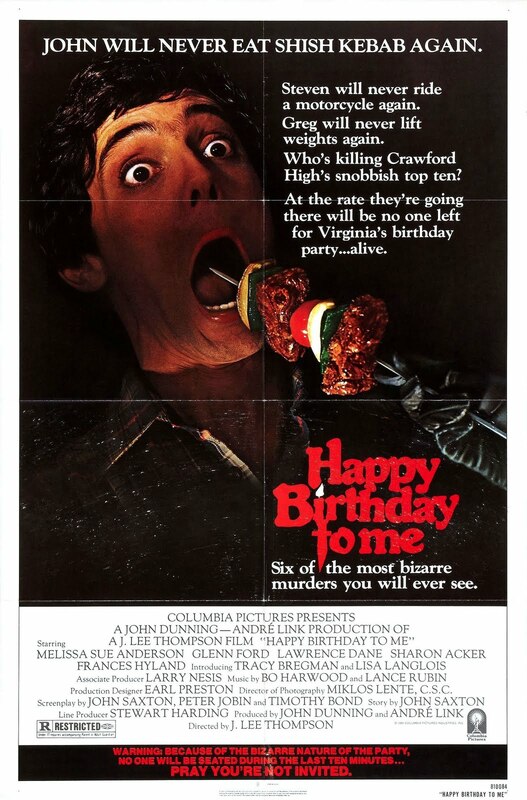 Review: By the time Happy Birthday to Me rolled into theaters in May of 1981, movie houses were becoming saturated with holiday themed slasher pics after the booming success of Halloween in 1978 and Friday the 13th in 1980. No government holiday stone was left unturned and no religious day of remembrance was safe from having a killer (or killers) hunting down people that just want to have a good Easter egg roll or plant in tree in honor of Arbor Day. See Prom Night, My Bloody Valentine, and Terror Train if you need a refresher. What sets Happy Birthday to Me apart from the others is that it actually feels like it’s trying for the majority of its running length, aiming to provide audiences with some unique kills and a fair number of red herrings to keep you guessing until the totally ludicrous finale. Underneath the gore and out of left field plot twists lies a fairly interesting film that isn’t totally lost along the way to its genre’s normal trappings. A puzzling late career entry for director J. Lee Thompson (the original Cape Fear, The Guns of the Navarone) and one of actor Glenn Ford’s last roles, this nicely budgeted Canadian produced flick has Mary Ingalls herself (Melissa Sue Anderson) as a popular girl who just can’t keep her friends alive. Still feeling the lingering effects of a traumatic brain injury due to a car crash that claimed the life of her mother, she starts to suffer blackouts and when she wakes up finds that another coed has been murdered. With her birthday approaching the guest list gets liberally trimmed by a killer that likes to off their victims in a most cinematic fashion (I mean, just look at the poster!). It’s clear that along the way the original script was jiggered with and lost some of its intended focus. Though it feels like it’s headed one way for its big reveal, the ending provided is one no one would ever be able to predict in a million years. I’m guessing there was a last minute reshoot to make the conclusion less obvious but in doing so it renders a heap of earlier clues and plot points useless. It’s a cheat and a big cheat at that, but it’s just looney tunes enough to make it memorable. Anderson never was that strong of an actress and it shows here as well. Whether crying, screaming, or saying her lines in a flat monotone, a Scream Queen she was not destined to be. Ford collects his paycheck without much shame while a bunch of Canadian teens never make that much of an impression, save for Matt Craven (Indian Summer) and Tracy Bregman as Anderson’s doomed chums.